Suspended SA Revenue Service (SARS) commissioner Tom Moyane’s attorney Eric Mabuza has labeled the commission of inquiry into SARS, which kicked off with public hearings this week, a "witch hunt". At the same time he confirmed that Moyane would be attending proceedings on Friday. Mabuza told News24 the process was not being undertaken in a fair manner and that efficiency was being used as an excuse to gloss over fairness. He added that the commission "was a way of getting at him [Moyane]", because the disciplinary process against Moyane had “hit a brick wall”. The disciplinary process against Moyane stalled after he was suspended in March. Former finance minister Pravin Gordhan has filed an affidavit detailing the charges against Moyane. These include that he misled Parliament; gross misconduct in his handling of a Fincancial Intelligence Centre (FIC) report into his former second-in-charge Jonas Makwakwa; and bringing SARS into disrepute. Moyane has objected to Gordhan deposing to the affidavit, saying that President Cyril Ramaphosa brought the charges. Mabuza has also raised an issue of conflict of interest with one of the panel members, Prof. Michael Katz. 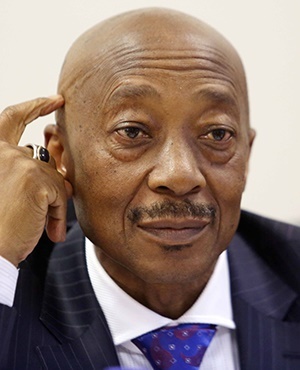 Katz, Mabuza has argued in correspondence addressed to the head of the commission, retired Judge Robert Nugent, is conflicted due to his connection to Ramaphosa – who appointed the commission and brought disciplinary charges against Moyane. "It’s a witch-hunt Where is the fairness?" News24 has seen correspondence between Mabuza and Nugent, which began on 22 June. Nugent writes: "I wish to inform you, for your information and as a courtesy to your client, that the Commission of Inquiry will be hearing evidence in public from 26 to 29 June 2018." Mabuza responds on the same day – indicating that due to the short notice, Moyane would not be able to attend the full hearings - but advances a request to address the commission to place matters on record. Katz, Mabuza argues, is conflicted due to his status “as the personal and business legal representative” of Ramaphosa. He further seeks “an undertaking from the commission that it will stay clear if dealing with any issue which is the subject matter of the pending disputes which have been placed before the disciplinary inquiry chaired by adv. Azhar Bham SC so as to avoid double jeopardy and manifest unfairness". Mabuza also indicated Moyane’s willingness to cooperate and wishes to make these submissions "at the commencement of the inquiry" on 29 June. Nugent responds by reminding Mabuza that the hearings in fact start on 26 June – but invites Moyane to make submissions with regard to the concerns raised before that time. Mabuza then indicates that, due to the short notice period "and other pressing commitments" Moyane would only be able to attend on Friday. "We are not making it up, you can see from the correspondence," Mabuza told News24. "Mr Moyane is not liked, and that is fine. But where is the fairness?" So far this week several former senior SARS officials have testified of a "culture of fear" under Moyane’s reign – and bombshell revelations have placed into doubt an extensive restructuring process undertaken by Moyane at a cost of R300m. The inquiry heard on Thursday of how, through the restructuring process, various senior officials were effectively sidelined. Nugent, at the commencement of proceedings on Thursday, reiterated a call for all members of the public or SARS employees to make submissions to the inquiry if they had facts to bring to light. He stressed that the panel was not weighing the evidence at this stage – but would wait until all submissions had been received before considering the weight of all the evidence. He said the inquiry was likely to hold more public hearings in August – while the panel would continue its work behind closed doors in July. "This commission is evolving – it is an evolving process," Nugent emphasised.